This breathtaking condo with 795 square feet of space to enjoy is located in the Village of Baytowne Wharf, overlooking the tropical swimming pool complex which includes both a master pool with its island in the center, an oversize kiddie pool with adjacent hot tubs all to be viewed from this 5th floor unit. This spacious one bedroom/one bath condo is on the top floor of the Bahia allowing it to have high ceilings adding to its wow factor. There is a pillow top mattress on the king bed providing the utmost in sleeping comfort and a queen sleeper sofa.. The expansive balcony with its furniture seating 4 boasts of a heavenly panoramic view of the gorgeous resort and Burnt Pine golf course. The living room with its tv/dvd/wireless internet overlooks both pools from the huge picture windows. The fully equipped like-new kitchen offers everything any cook would need. Free shuttle to the beach, 2 beach chairs and an umbrella in the unit for your use, free wifi and no check in lines--you go directly to the unit. With its prime location right by the pools, a minute's walk takes you into the area of the Village with restaurants, shopping, entertainment for adults and children alike, from dueling piano bars to zipline, euro bungy, wooden climbing structures, a fabulous playground, dancing, just a lot of fun to be had. This is everyone's dream vacation and you don't have to get in a car once you arrive. It's all located in the Village. Just across the highway is the private resort beach with parking available. Being located in The Resort, you will find golf courses, tennis, biking, catch and release fishing, as well as a huge marina with its dinner cruise ship. Fireworks are fantastic in the Village during special occasions and events year around. DESTIN MEMORIES, LLC is an independent company that is not affiliated with, sponsored by or associated with any entity containing the word “Sandestin™.” Any use or reference to the word “Sandestin™” is used in the factual sense to geographically identify a property or location and not to suggest any affiliation with any SANDESTIN™ branded entity, product or service. Everything about this rental experience was fantastic. Bette worked with me to get the right price and condo for our family. The room was very clean and roomy. The AC worked wonderfully for the stay. We did have one small incident that was quickly and professionally resolved. Would love to work with Bette again on our next stay! Thank you and I am always here for my guests. We had a great vacation at the Sandestin Grand Resort in Bahia 4521. Great view of pool, beach chairs, sheets. Dishes in condo had metal rims that were not microwavable. An we had a difficult time understanding what pools were available to us to use during our stay. Pool was not heated and we did not know that prior to stay. We were told the pool was heated. The pool for Bahia is right outside the door of Bahia. If you ever have any questions, I am always available to answer you. We have 24/7 oncall as well. I will be putting new dishes in the unit and would have for you had I known. This unit is bigger than it appears in pictures! This unit is bigger than the pictures suggest & honestly much. Over! I cooked in the kitchen several times and had everything i needed. The layout of the condo was spacious and not at all cramped. The view from the window was right over the pool. The master bed was comfortable and the location of the unit wasn’t far from the village. You are seriously super close to the pool too. I have stayed all over this property and this is one of my favorites! I will make sure we stay here again! 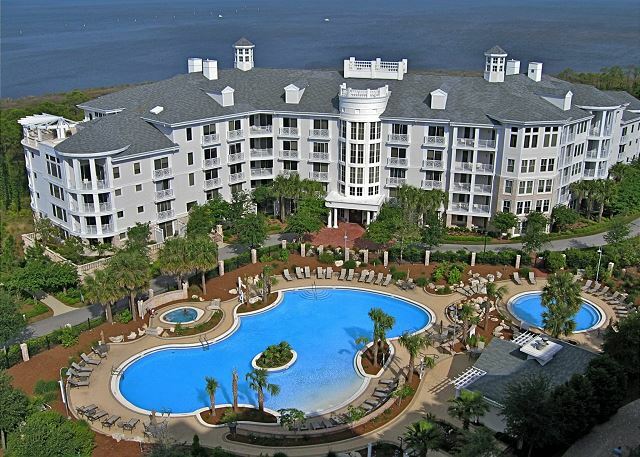 We always loved staying at the Grand complex and Destin Memories is always so good to work with. The room was nice, well-equipped, and clean. Great View, location & quality! Wish we could have stayed longer! Come back often. We love having you. Beautiful 5th floor condo. No issues with check in, the owners gave the best brief but detailed welcome package on how to check in & out. We didn't need to call or contact them once! Awesome stay & will be back to this property soon! Thank you for seeing what we see with this condo. And Destin Memories is grateful for your comments about the Welcome letter. Our goal is for you to have an uninterrupted vacation with our team available if needed. We stayed four nights in this well equipped condo. Very clean, quiet and well maintained. Living area and bath are isolated enough from the bedroom to allow those of us who stay up late to not disturb people who go to sleep earlier. Management company provided good upfront info that made it easy to check in and out. Would stay here again. And Destin Memories thanks you. Very nice condo, room was clean and comfortable. The amenities close by are wonderful and kid friendly. Please come back often. We are thankful you see what a great place this is. What can I say, look no further. Beautiful place to stay. Everything was magnificent . From the condo to the grounds, the pools to beach, the shops to the restaurants. All in walking distance or a tram ride away. The only regret was we needed more time, a do over will be 7-10 days next time for sure or maybe retire there. We so thrilled that you see what we see in this unit and area. Do come back! We had another great stay at Bahia 4521. This was our second time in this condo and we picked it again because we love it so much. Has everything you need for a family vacation. Great views of the grounds and pool. Great patio and very comfortable bed! Very clean and perfect distance to Baytowne Wharf! This condo was absolutely everything we expected and desired. The description provided on the site was very accurate. It is conveniently located near the village where there are a TON of things to do and right near the pool! It was very clean and organized. Although we didn't use the kitchen, it was nicely stocked with everything you would need to cook/serve meals. The view every morning was beautiful. My husband and I visited for my birthday for 4 days and later wished we would have booked for a longer stay. This will be our go-to unit for our future trips to San Destin if it's available. Management office is incredibly friendly and helpful. They also provided us with beach chairs and beach umbrella. If you stay here, don't buy water or ice as there is an ice/water machine right in the hallway. It's a very quiet and peaceful place. Everything functions properly. Plenty of towels were provided. The management office provided a very detailed email prior to us arriving, which was very helpful in helping us pack/prepare for our trip. The San Destin Wine festival was taking place this weekend, and it was literally steps from this unit. We enjoyed ACME, Roberto's Pizza, and Another Broken Egg. We chose to drive to the beach instead of taking the free tram. It's about a 5 minute drive across HWY 98. I can't wait to book this unit again! Well, let's get you booked. We are go thankful you found Destin Memories helpful and providing a great unit for your enjoyment. The unit was in great shape and the facility was extremely clean. No complaints from me or my wife. We would gladly stay there again. Casey, I hope the rose petals on bed, chocolate covered strawberries and anniversary sign helped make your stay perfect. Great vacation! Room was perfect! Great views, great simple check in process. Parking was great! Tram to the beach was good but could benefit from a ramp for wagons ice chests that are brought to the beach. Otherwise great great great room!! Great clean condo and loved the tall ceilings. This condo lives big and has wonderful views off the balcony. Kitchen was very well stocked. The building is very solid and very quiet. Just steps to the pool area. Loved walking over to the harbor and docks. My rental agent Bette could not have been more helpful and I look forward to coming back again. Thank you for your review of this condo and your wonderful comments. This is a nice unit and I could not have painted a better description that you have. Bette is great to work with and we are happy to have her with us!! We look forward to having you guys back with us soon!! This unit was just fine for a short term stay. We were there for five weeks and found some things lacking: no storage in the bathroom, coffee maker very old, cannot microwave the dishes, no storage for groceries, the deck and walls need a painting, hot and cold water were reversed on the washing machine, and not a comfortable chair to sit on. It was a great location and a good value for the Monthly rate. I would recommend it if the owner added a little tlc to the unit.